Free shipping offers are something that online shoppers scour the Internet for. Now you can easily give your customers free shipping if their order exceeds a set value. 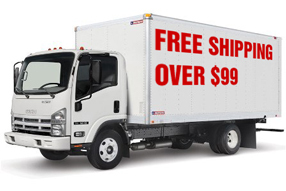 Not only can you offer free shipping, but you can also specify which shipping method(s) is to be used for your free shipping offer. All orders over $99 get free shipping with USPS Priority Mail. The Free Shipping Based on Order Value tool also allows you to specify certain items that are to be excluded from your free shipping rule.